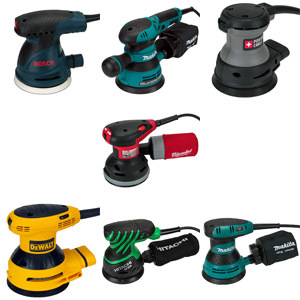 The 4 1/2" angle grinder market is full of models competing for your attention. Prices vary widely, yet all the entries seem to look the same. This week we decided to pick a green grinder out of the pile to review in our shop. 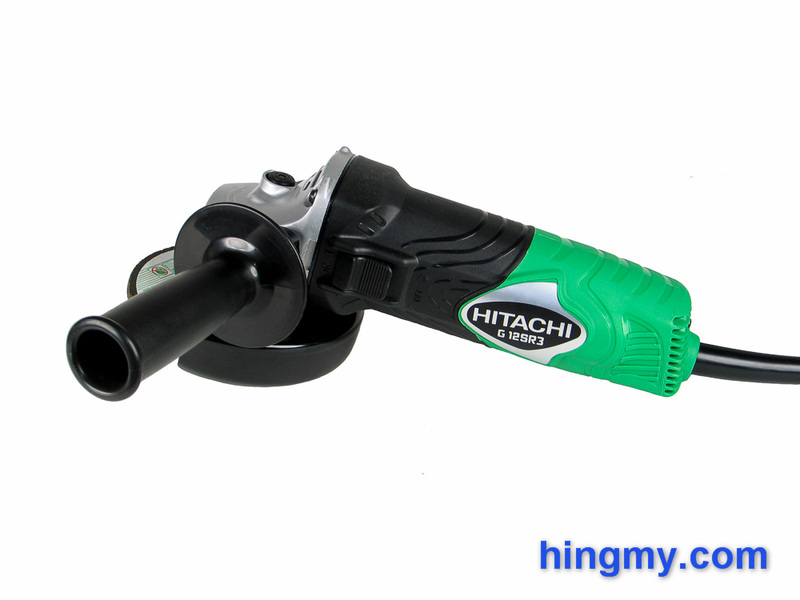 The Hitachi G12SR3 is a surprisingly cheap angle grinder that gets great reviews all over the net. Let's take a look if the G12SR3 can deliver on its reputation in the Hingmy shop. 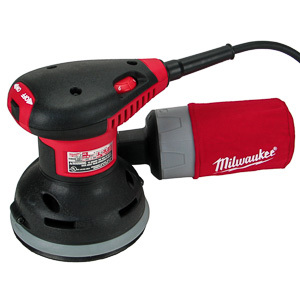 The G12SR3 is a small form factor 4 1/2" grinder. It is intended for light to medium duty work. 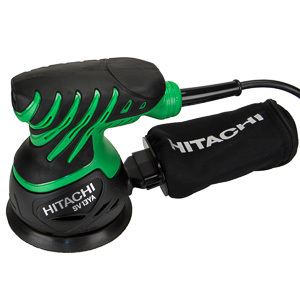 Like all Hitachi tools the G12SR3 is mostly black and green. 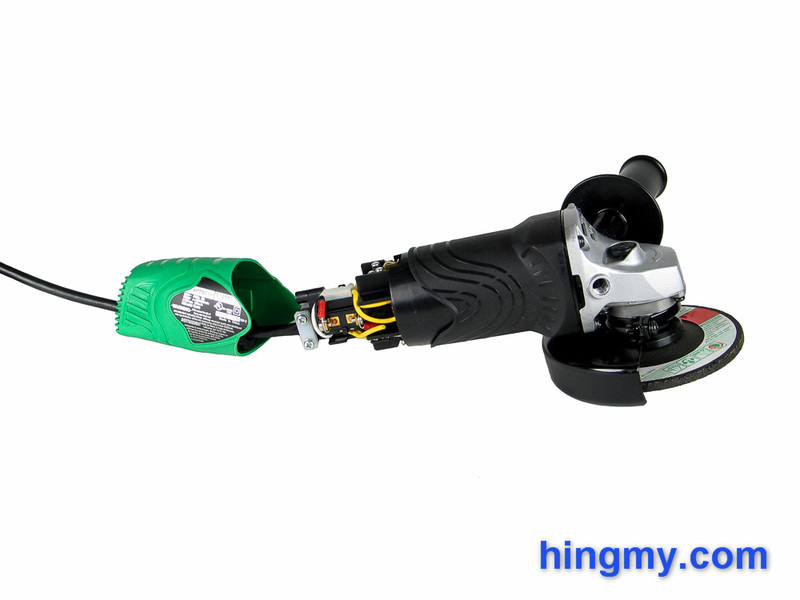 The tool follows the standard angle grinder design of a metal gearbox married to a plastic barrel-shaped motor housing and grip. Everything about the grinder feels solid and durable. The G12SR3 survived several drop tests without showing any signs of damage. The plastic housing and metal gearbox are far more likely to put a dent into the floor than to break themselves. The top of the grinder is flat to allow the tool to rest securely upside down. 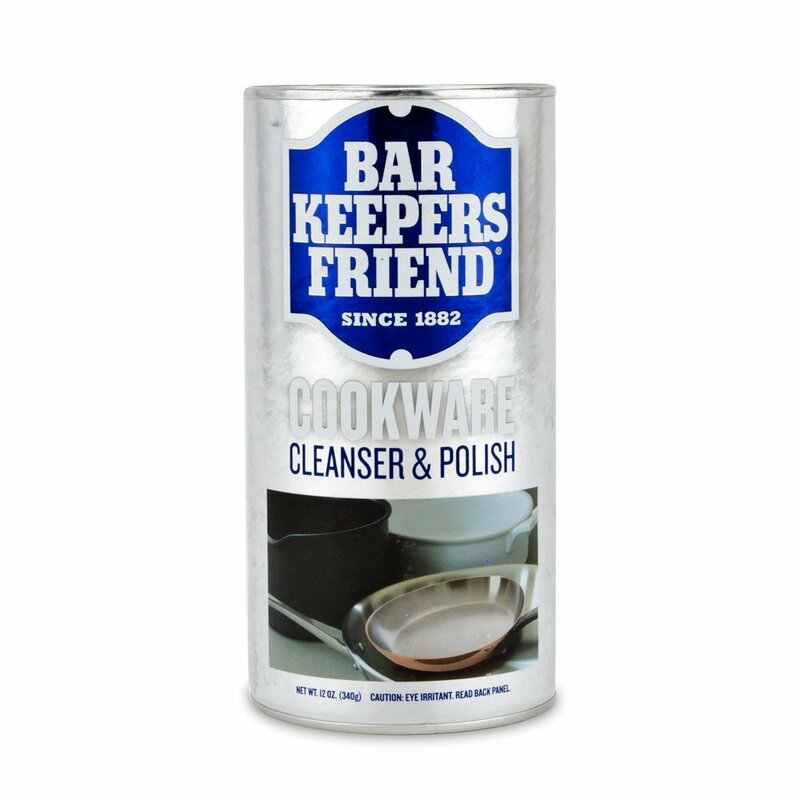 There are no rubber or plastic protectors on the top of the body to protect the tool or the surface it rests on. The tool makes contact with its metal housing. Scratches are the result. The On-Off switch of the G12SR3 is a slider type with a lock-on feature. The grinder engages when the switch is pushed forward and held in that position. The switch disengages when the user lets go. To keep the grinder running at all times the switch can be latched into the On position by pushing down on the front of the slider to engage the latch. The grinder does not have a soft start feature. It comes to life with a noticeable lurch as the disk spins up. Starting the grinder while the disk makes contact with the work piece is not really possible. Once the initial toque battle is over the grinder settles into a nice constant hum. Like most grinders it makes a racket when turned On. Hearing protection is a must. The metal blade shield mounts to the gear housing with a compression ring. Two large Philips screws secure the ring. The shield rotates a full 360 degrees around the gear housing and can be locked down in any position. The sides of the shield are deep enough to catch and direct all sparks toward the bottom of the shield. When configured in the standard down-cutting configuration, the G12SR's shield ejects almost all sparks at the bottom of the shield. Some escape to the sides. None are ejected in the direction of the operator. The auxiliary handle can be installed on both sides of the head. 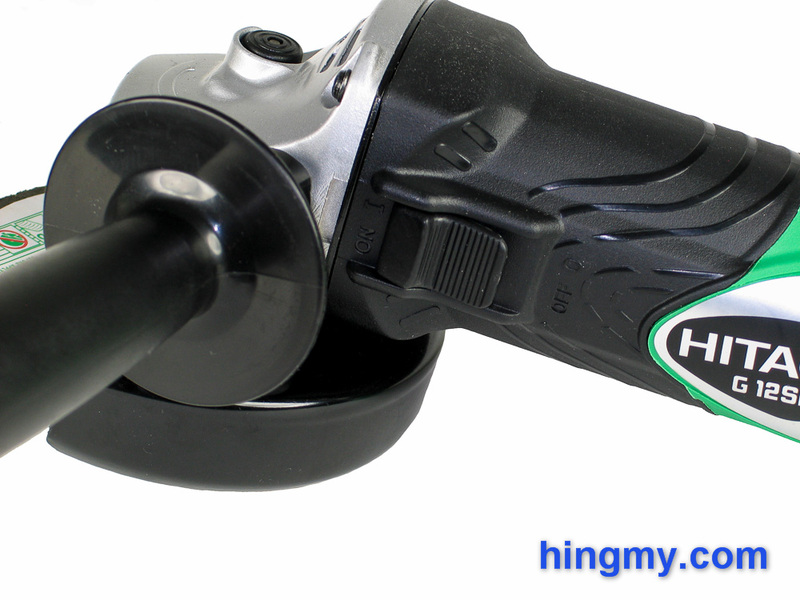 Unlike on most grinder, which mount the handle perpendicular to the barrel of the tool, the handle on the G12SR3 is leaning forward by about 15 degrees. This creates a unique feel when handling the grinder. The tilted handle makes it easier to push forward and down at the same time. If you have used mostly grinder with perpendicular handles this takes some time to get used to. Disk changes are done with a spindle lock and a standard blade wrench. The all-metal spindle lock is remarkably well designed. 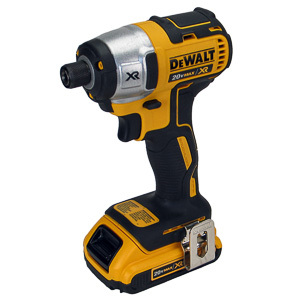 The very large metal button at the head of the tool is very easy to press and hold. The spring below the button has just enough force to return the button to its resting position. Holding the spindle lock down takes very little finger strength, which is not a given in the grinder market. The button on some models is outright painful to press and hold. Brush changes are fast and simple to perform. A single screw secures the green rear housing to the head of the tool. With the screw removed the housing slides right off and exposes the two brush mounts. Removing and replacing the carbon brushes takes some time, but is not difficult, if you have the foresight to take care of it on a clean workbench and not on a job site. The 6amp motor in the grinder provides enough power to make the G12SR3 perform like a 4 1/2" grinder should. 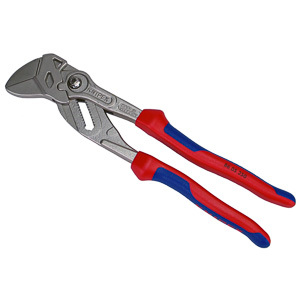 It has no problem cutting through rebar and angle iron at a reasonable rate. If you push aggressively the tool starts to labor. After a while it will overheat and enter the danger zone. If used properly, however, the grinder will perform its task admirably. The grinding wheel spins at a constant speed and performance never falters. Heavy, continuous use is not the forte of the G12SR3. The grinder starts to overheat after 10-20 minutes of continuous use. If work is not stopped the grinder will burn out. This should not be considered a flaw of the tool. As an entry level grinder the G12SR3 was not designed for this sort of load. Hitachi sells other 4 1/2" models that are significantly more powerful (and more expensive) for this scenario. At only 3.1lbs the G12SR3 is very easy to handle. As with all grinders the large spinning mass of the disk makes handling the grinder still somewhat awkward, but this grinder handles better than most. The forward leaning handle entices the user to take aggressive cuts. This may not be the best option for such a lower power grinder. Overall the G12SR3 performs well when used for light duty work. It's very low price makes it an attractive option for a grinder that sees less than 10 minutes of duty every hour. At 6amps the grinder has enough power to complete most tasks. Around the home the G12SR3 is a great option. The G12SR3 takes the position of the low to medium duty grinder in Hitachi's 4 1/2" angle grinder lineup. It's an inexpensive, yet reasonably powerful tool. 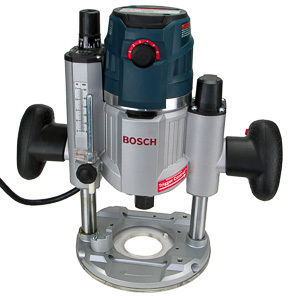 There is even a less powerful model for anyone who needs a grinder for just a few cuts here and there. If you are looking for a more powerful grinder that has a longer duty-cycle Hitachi has your back. Their 4 1/2" grinder lineup has models ranging from 5 amps to 13 amps. Keep in mind that as the motor size and capabilities of the grinder increase, so does the price. Hitachi's clear pricing model allows you to buy a grinder that fits your power requirement and budget. 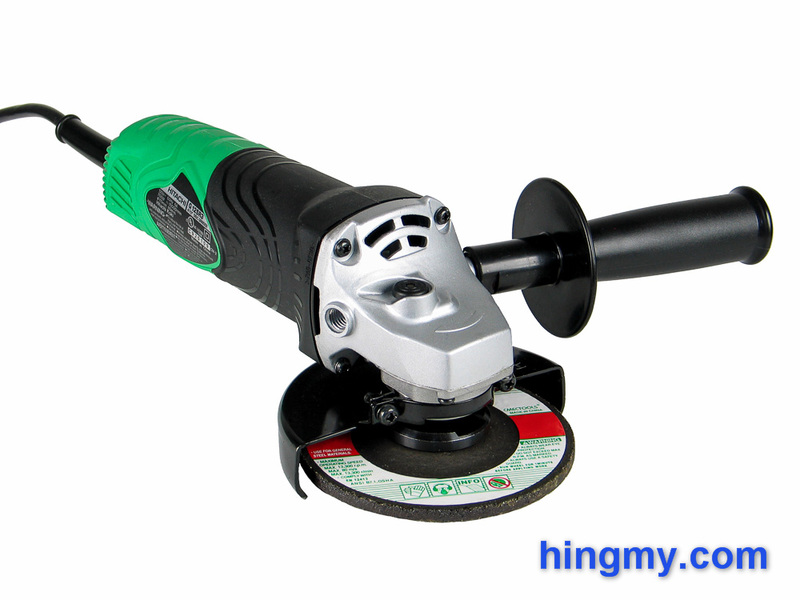 Hitachi's G12SR3 grinder can be smart purchase, if you know what you are looking for. The team at Hitachi has designed a tool that performs well in light to medium duty applications. If you plan on using your grinder for less than 10 minutes an hour, the G12SR3 will serve you well. If you run the grinder without stopping, it will burn up in your hands the day you purchased it. While this does not seem like a good value proposition, Hitachi makes it all right again with the price. The G12SR3 is so inexpensive that it makes sense to keep it around for just those light jobs. 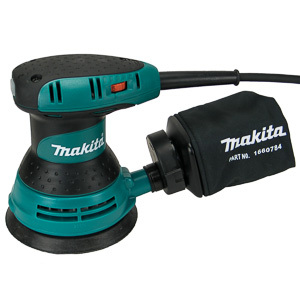 It is lighter than most heavy duty grinders, and has enough power to complete any job. If you are planning to use the grinder around the home, you can buy the G12SR3 without hesitation. There is a surprising amount of quality for what you pay for it. Hitachi has found a splendid balance between performance and price.